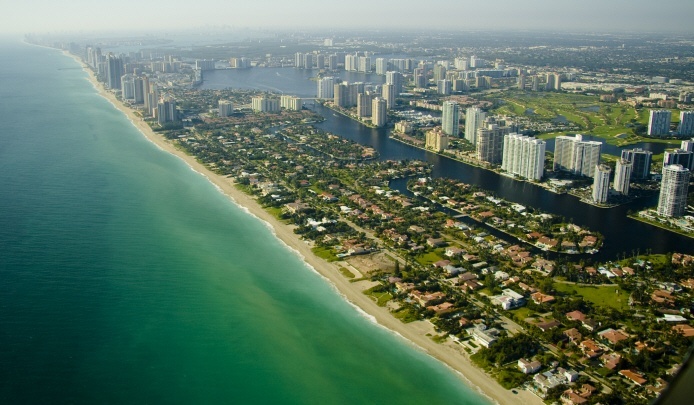 Golden Beach is a cozy town just north of Aventura and Sunny Isles Beach. One of the town’s best and most unique features is that that commercial activity and towering condos are prohibited, meaning every home has water views and it is most similar to Palm Beach in character. Golden Beach homes have access to private beaches and with beautiful vistas that offers much of South Florida within a short reach. Golden Beach has a total of 270 single family homes. Residences are mostly located on the waterways of Intracoastal or directly on the Atlantic Ocean and can be as large as seven bedrooms. There are a many multimillion dollar Golden Beach oceanfront mansions with pools as a standard and thousands of square feet of living space on generously sized lots. Golden Beach and Golden Isles’ spectacular Intracoastal waterfront residences are similar in lifestyle to living on one of Miami Beach’s man made islands. Aventura Mall and Bal Harbour are located a short distance from Golden Beach for upscale shopping and dining, and South Beach is under 20 minute drive for a active nightlife. These homes are indicative of luxurious beach living in the heart of South Florida.